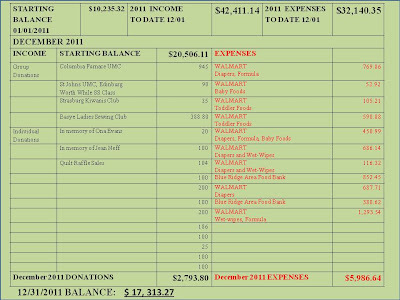 SINCE IT OPENED IN 2010.
including detailed financial and donation statements. clicking on The Shenandoah County Schools link. SH for her gift in honor of Clara Hamlett. AM for her gift of $100. Cedar Creek Christian Church for their donation of $100. Laurel Hill CWF for their donation of $100. Otterbein UMW for their gifts of $50. Columbia Furnace UMC for their donation of $170. $10,882.55 for A SMALL HAND. Massanutten VFW Post 2447 for their donation of $200. Toms Brook UMC for their November Giving of $30. D&JC for their gift of $100. Seventh Street Christian Church for their donation of $500. F&JW for their gift of $200. St. Andrews Episcopal Church Guild, Mt. Jackson for their donation of $130. TT for his steadfast help and donation of $2000. St. Jacobs Lutheran Church for their donation of $200. Bryce Ladies Sewing Guild for their donation of $428. J&CB for their gift of $100. CH for her gift of $500. R&JM for their donation of $225. JAD for her gift in honor of Doc Downey. R&LR for their gift of $100 and their wonderful help. M&JE for their gift in honor of Frank Wise. The INTERACT club of Stonewall Jackson High School for their Winter fundraiser that realized $134.39. J&DC for their gift of $150. Toms Brook UMC for their October Giving of $30. Toms Brook UMC for their September Giving of $40. The First Church of Columbia Furnace for their donation of $125. Toms Brook UMC for their August Giving of $30. B&KJ for their donation of $50. The Hamburg Ruritan Club for a donation of $175. SK for her gift of $20. Mrs M for her donation of $255. St John's UMC Edinburg for a donation of $50. WD for his gift of $50. JL for his gift of $50. GC for her gift of $24. MB for her gift of $60. First Christian Church of Girard, Ohio for their Mission Trippers and their donation of $410. Girard First United Methodist Church for Sarah and their donation of $250. SMS for her donation of $100. DJS for her donation of $100. ARC&JCC for their donation of $50. Toms Brook UMC for their July Giving of $30. JAMc&SKTMc for their donation of $25. Toms Brook UMC for their June Giving of $30. First Church of Columbia Furnace for their gift of $100. The Staff of Sandy Hook Elementary for their June Community Outreach donation of $100. JC&DC for their donation of $250. Toms Brook UMC for their May Giving of $25. The West Shenandoah Ruritan Club for their donation of $300. Toms Brook UMC for their April Giving of $25. WALMART Store 3344 for a WALMART COMMUNITY GRANT of $500. F&JS for their gift of $100. The Happy Hustlers, Zion Christian Church, Maurertown for their steadfast help and gift of $200. WALMART Distribution Center 7045 for a WALMART COMMUNITY GRANT of $1000. Seventh Street Christian Church Richmond Outreach Committee for their gift of $400. The Prince of Peace Evangelical Lutheran Church for their donation of $100. Otterbein Chapel UMC for their donations of $50. CS for her gift of $50. The Christian Church (Disciples of Christ) for a grant of $1000 from the Disciples Home Missions. 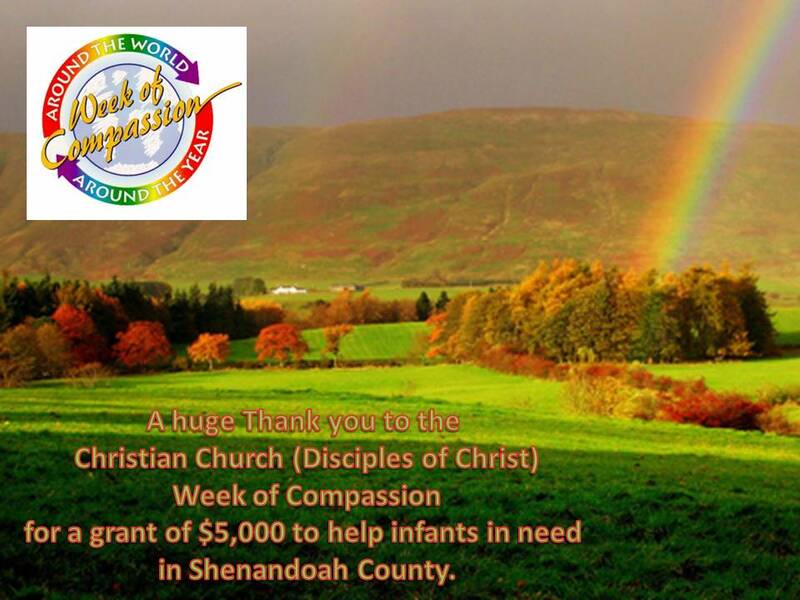 The Christian Church (Disciples of Christ) for a grant of $500 from Week of Compassion. Woodstock Christian Church CMF for their gift of $110. Toms Brook UMC for their March and Lenten Giving of $342. Mount Jackson Masonic Lodge 103 for their gift of $200 in honor of a lost member. An anonymous Richmond Foundation for a grant of $20,000 and for their wonderful help over the past few years. The Edinburg Christian Church CWF for their donation of $400. The Forestville-Quicksburg Ruritan Club for their donation of $200. HS for his gift of $20. Toms Brook UMC for February Giving of $31. STG&DRG for their donation of $20. SW for his donation of $20. B&KJ for their gift of $50. The Basye-Bryce Mountain Lions Club for their annual budgeted donation of $300. 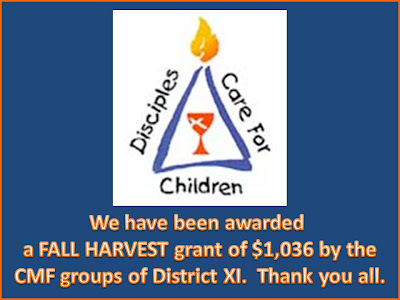 The Virginia District 11 CMF of the Christian Church (Disciples of Christ) for a Fall Harvest Grant of $3,000. First Church of Columbia Furnace for their gift of $150. The Otterbein Chapel UMW for their gifts of $50. TST for his gift of $2000. JB&SB for their donation in memory of Mr. Mrs. Stanley Getz. St Paul's UMW for their gift of $100. ME&JE for their donation in honor of Frank Wise. RM & JM for their gift of $200. Toms Brook UMC for their December Giving of $35. Prince of Peace Lutheran Church WELCA for their gift of $100. Maurertown Brethren Church for their donation of $921.84. FW&JW for their donation of $200. SK&CEK for their gift of $300. NY&WY for their donation of $50. Otterbein Chapel UMW for their donations of $50. DED for her gift of $25. C&CA for their gift of $50 in memory of Katelyn. R&LR for their donation of $100. The Women of Woodstock Presbyterian Church for their gift of $100. Outreach at Seventh Street Christian Church for a gift of $400. SH for a gift in honor of Clara Hamlett. Toms Brook UMC for their November Giving of $35. The McC family for their gift of $25. St Jacobs Church Sunday School, Edinburg, for their donation of $200. The St Andrews Guild of St Andrews Episcopal Church for their gift of $267.50. The Bryce Ladies Sewing Guild for their donation of $435 and their gift of quilts. J&CB for their gift of $100 in honor of the Beachy family. J&LM for their gift of $200. The Stonewall Jackson High School INTERACT club for their monetary collection of $221.09 plus baby essentials valued at over $700. Avery and family for their gift of $15. The Valley Foundation for their donation of $5400. Mt Calvary UCC, Woodstock for their gift of $150. Toms Brook UMC for their October Giving of $35. The Strasburg Kiwanis Club for their donation of $75. Cedar Grove Christian Church for their gift of $100. DC&JC for their gift of $150. WD&LD for their gift of $100. The Strasburg Kiwanis Club for their wonderfully consistent help and check for $75. MD&ED for their gift of $50. LC for her gift of $150. Toms Brook UMC for their September Giving of $35. The First Church of Columbia Furnace for their gift of $100. The Kiwanis Club of Strasburg for their September donation of $75. 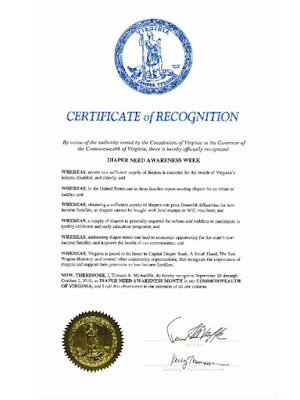 Designated donors through the United Way of Northern Shenandoah Valley for their contributions of $85.57. Toms Brook UMC for their August Giving of $35. JC&DC for their gift of $150. MD&ED for their gift of $200. Donors for gifts in Memory of Doug Hawkins totaling $25. Caroline, Bridget and Laurel for their generosity and hard work cooking and selling cakes to raise funds for us, and for their gift of $33. DC&JC for their gifts of $200. WDD for his gift of $50. Toms Brook UMC for their July Giving of $65. CH for a donation of $50 in Memory of Elizabeth Dalton. The Hamburg Ruritans for their donation of $175. The Kiwanis Club of Strasburg for their August donation of $75. Donors for gifts in Memory of Doug Hawkins totaling $320. Donors for gifts in Memory of Gertrude Mantz totaling $50. Otterbein UMW for their gifts of $75. Kiwanis Club of Strasburg for their June/July donations of $150. Toms Brook UMC for their June Giving of $35. Powhatan Ruritan Club for their gift of $100. The Ohio Mission Trip Ladies for their hard work, donations of clothing, toys, books, and for their combined monetary gifts of $720. DC&JC for their gift of $100. Columbia Furnace Union Friendship Class for their donation of $300. St. Luke Fairview Ruritans for their donation of $1142.98. 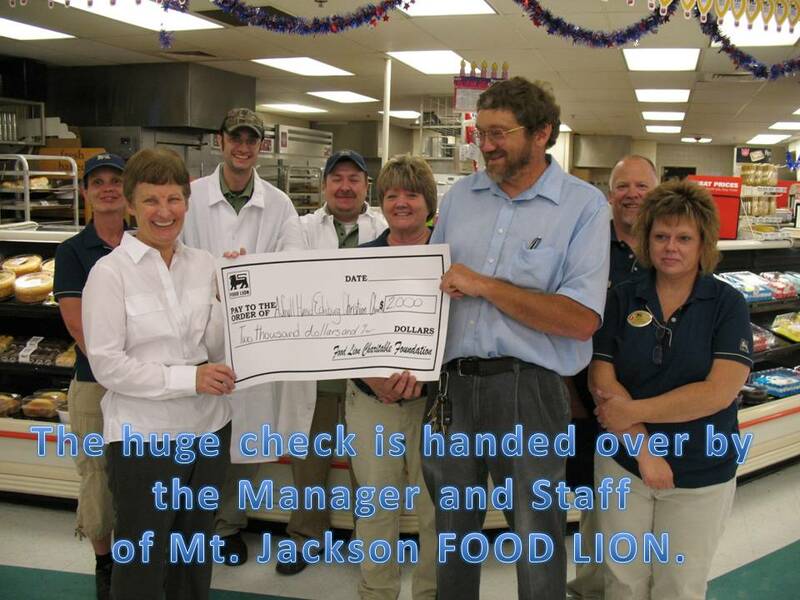 Food Lion Feeds Charitable Foundation for grant of $4,000, the fifth successive year that they have helped us! Zion Lutheran Church for their staunch help and donation of $781. Woodstock UMC Women of the Well for their donation of $250. The Interact Club of Stonewall Jackson High School for their gift of $31.90. The St. Luke Fairview Ruritan Club for their donation of $300. Toms Brook UMC for their May Giving of $35. The Forestville-Quicksburg Ruritan Club for its donation of $200. Three donors through The United Way NSV Designated Giving Campaign for their combined donation of $171.14. J&DC for their gift of $100. Donors for gifts in Memory of Doug Hawkins totaling $180. WALMART Community Foundation for a grant of $1500 from the Woodstock Supercenter. Toms Brook UMC for their April Giving of $35. The Zion Christian Church Happy Hustlers for their gift of $200. The Massanutten Antique Tractor and Gasoline Engine Club for their Spring Banquet auction and raffle proceeds of $801. Maurertown Brethren Church for a donation of $770. FW&JW for their gift in celebration of their first great grandchild Owen Ellis. Reformation Lutheran Church for a donation from their Church Endowment Fund of $1000, and for their repeated help. SLK for her gift of $100. Toms Brook UMC for their March Giving of $243. First Church of Columbia Furnace for their donation of $100. 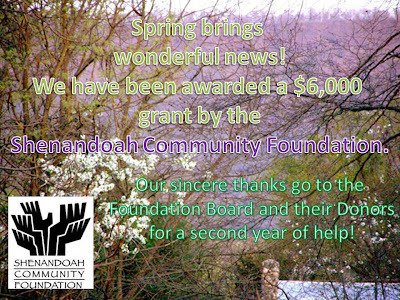 The Shenandoah Community Foundation for a grant of $2,000. St Luke Fairview Ruritans for their donation of $200. The CWF of Edinburg Christian Church for their gift of $400. The staff of Ashby-Lee Elementary School for their donation of $423. Otterbein Chapel UMW for their regular donation of $25. Toms Brook UMC for their February Giving of $56. The Smith Family in honor of Harper's first birthday. Strasburg Kiwanis Club for their monthly donation of $75. D&JC for their gift of $150. An anonymous donor for a cash donation of $40. TA for her constant help and gift of $100. Mt Clifton UMW for their gift of $100. Mt. Zion Lutheran Church for an additional $50 from their Christmas Envelope Collection. Otterbein Chapel UMW for two donations totaling $50. Walnut Springs Christian Church for their Christmas Collection of baby essentials for our children and for monetary donations of $160. Toms Brook UMC for their January Giving of $65. Gravel Springs Lutheran Church for monetary donations of $40 and for four boxes of baby essentials. Basye Bryce Mountain Lions for a grant of $300. 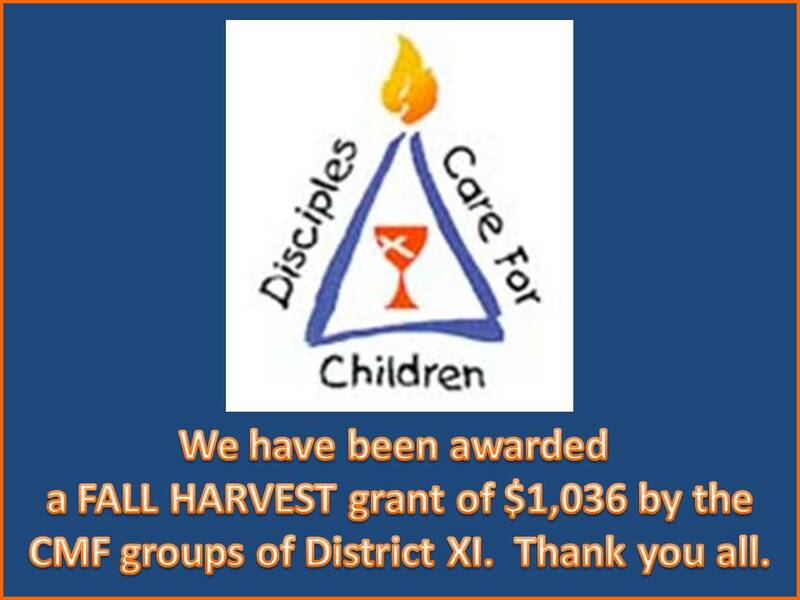 The Christian Church (Disciples of Christ) District 11 CMF for a Fall Harvest Grant of $3000 and for their staunch and varied support. An Anonymous Richmond Foundation which supported us in 2013 and 2014 and awarded us a grant of $20,000 for 2015. Their help has been pivotal for our survival. S for her gift in honor of Clara Hamlett's Birthday. Strasburg Kiwanis Club for their gift of $75. Toms Brook UMC for their December Giving of $65. St. Jacobs Lutheran Church Sunday School for their donation of $200. Maurertown Brethren Church for their donation of $1132. Mt. 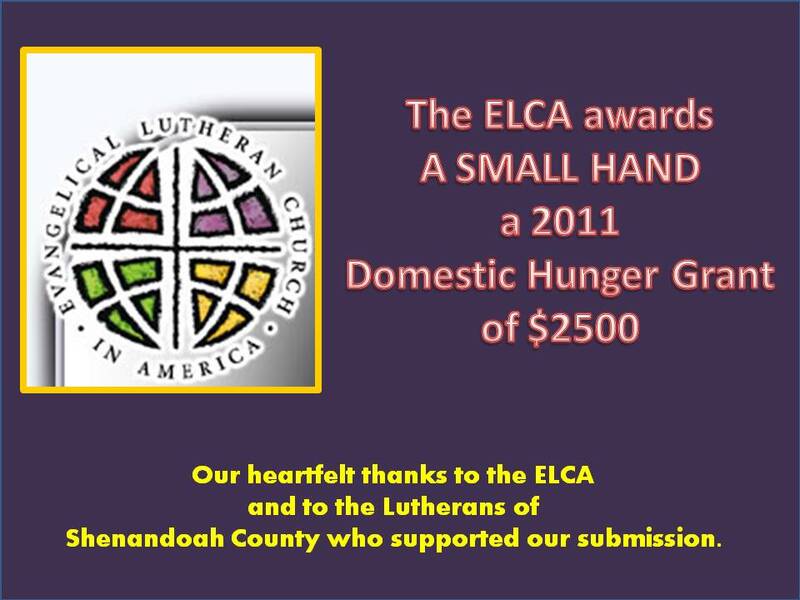 Zion Lutheran Church for their Christmas Envelope Collection of $473.90. DD for her gift of $25. RM&JM for their gift of $200. JC&DC for their gift of $225. Philip and Joan Whitacre for collecting $158.60 in nickels! And for all you have done for A SMALL HAND. How many people do care? in our community and one deserving of action. DNG for her gift of $75. 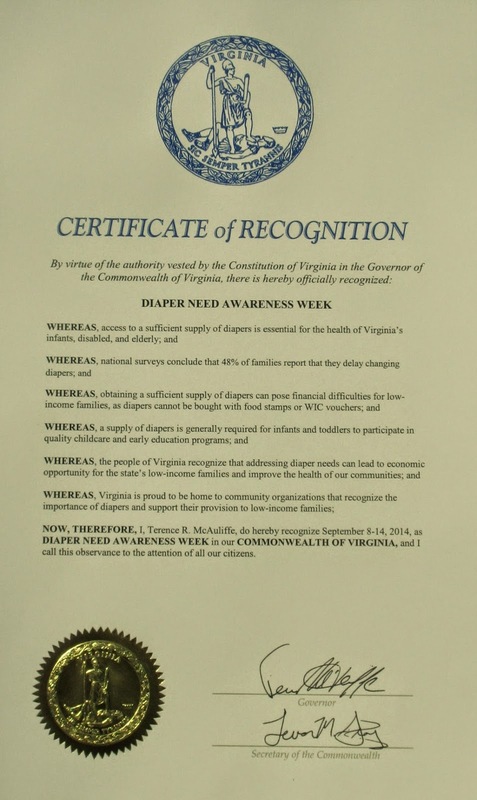 Donor Designee United Way of Northern Virginia for a donation of $27.95. DM&DM for their gift of $500. J&DC for their gifts of $170. Strasburg Kiwanis Club for their gift of $70. Toms Brook UMC for their November Giving of $65. TA for her gift of $100 and for all her help. CEK&SMK for their donation of $350. The Staff of Shenandoah Valley OB/GYN Maurertown for their donation of $125. The Massanutten Antique Tractor and Gasoline Engine Club for their gift of $500. T&J&C for their gifts and their donation of $100. A&K&A&LM for their gift of $25. C&BH for their staunch help and gift of $300. N&WY for their gift of $50. The Bryce Ladies Sewing Club for their gifts and their gift of $406. Cedar Creek Christian Church for their donation of $200 and to the children of Cedar Creek for their gift of $30. BC&LC for their donation of $20. WLD&BLD for their donation of $50. 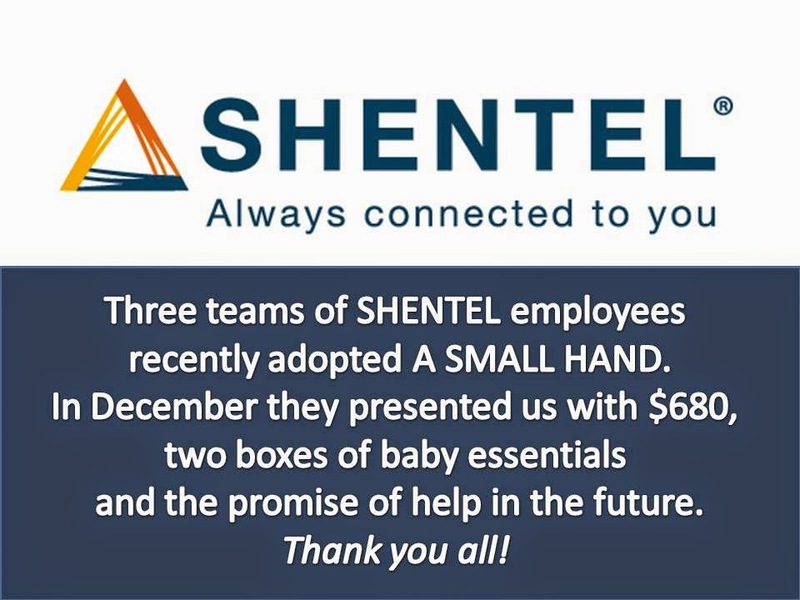 Employee Teams from SHENTEL for their donations of goods and $680. AM for her repeated help and a gift of $100. Otterbein Chapel UMC for their gift of $25. 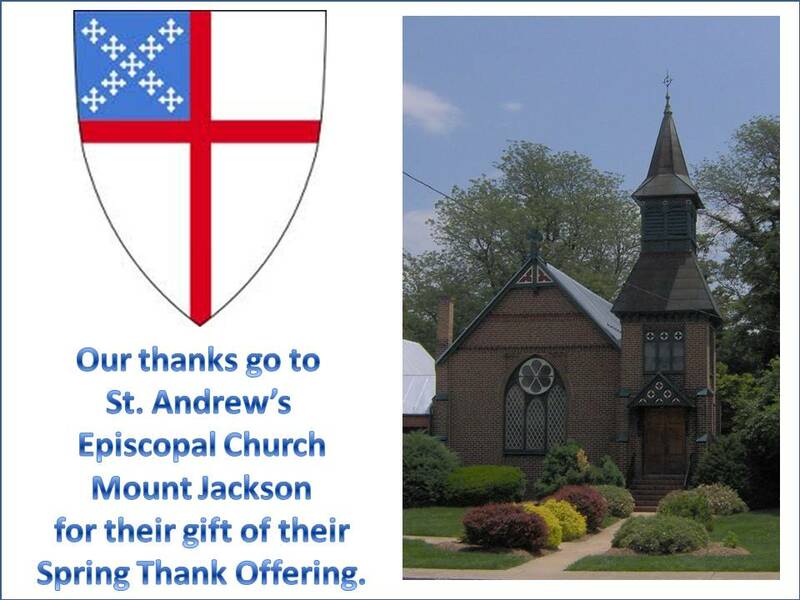 St. Andrews Guild, St. Andrew's Episcopal Church, for their gift of $100. The Interact Group of Stonewall Jackson High School for their donation of $78.80 and for their wonderful CANDYLAND fundraiser. 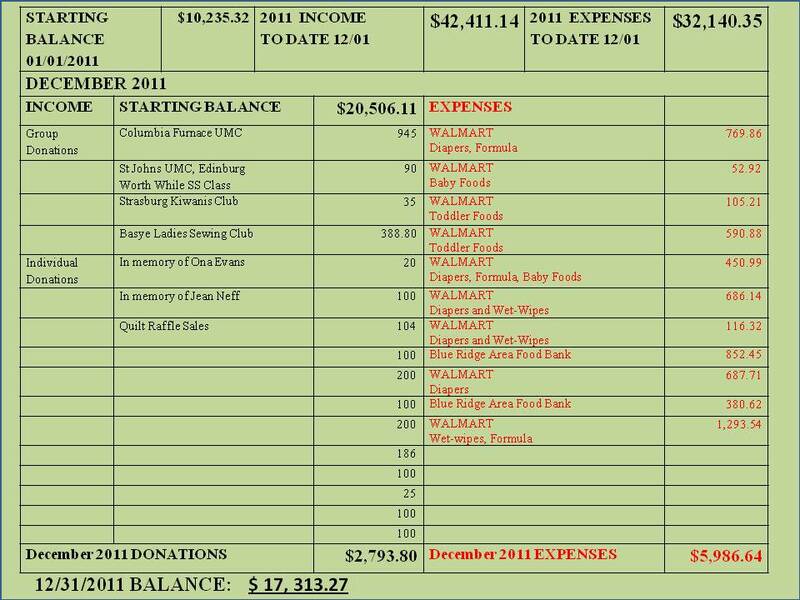 Columbia Furnace UMC for its Christmas collection for A SMALL HAND of $914. DH a donation in honor of The Beachy family. Seventh Street Church Outreach for their donation of $200. FW&JW for their gift of $200. TST for his donation of $2000. The Rhodes family for their gift of $100. Wakemans Grove COB for their donation of $115. Stephanie for her donation in honor of her mother Clara Hamlett. Valley Heath for its Give Me Five sponsorship of $250. The Strasburg High School FCCLA for raising $405 for Give Me Five! Wm. B. Holtzman for his generous donation of $5000. Otterbein Chapel UM Women for their gifts of $50. J&DC for their gifts of $172. Toms Brook UMC for their September Giving of $65. The Valley Foundation for their grant of $1,000, for their hard work and wonderful support over the years. Zion Lutheran Church for its donation of $200. RH for his gift of $50. Beta Sigma Phi Sorority, Woodstock Eta Chi Chapter, for 337 nickels and for 62 family meal bags which they distrbuted 10/30. Edinburg Christian Church for 147 nickels. Strasburg Lutheran Church for 635 nickels. Mt Hermon UMC for 223 nickels. Mt Hermon United Methodist Women for their staunch help and donation of $150 to Give Me Five! Columbia Furnace UM Women for their gift of $200. Ebenezer Christian Church for their gift of $50. The Strasburg Kiwanis for their donation of $70. CB for her gift in honor of Ibby Stratton. Strasburg Christian Church for their donation of $95. Otterbein Chapel UMC Women for their gift of $25. The children of the Maurertown Brethren Church Vacation Bible School for their donation of $209.22. The Food Lion Charitable Foundation for a grant of $3500; we are grateful for a third year of major help from the Foundation. A donation of $100 from The First Church of Columbia Furnace in memory of Marian Mantz. A Birthday gift of $200 for CW from JW. J&NM for their donation of $1,000. AF for her gift of $100. BF for his gift of $50. WD for his gift of $25. J&DC for their gift of $222. The women of Mt Herman UMC for their donation of $200. The Strasburg Kiwanis for their enormous help and their donation of $500. AWB for his donation of $400. Veterans of Foreign Wars Post 2477, Edinburg VA, for their donation of $200 and for their wonderful help over the years. 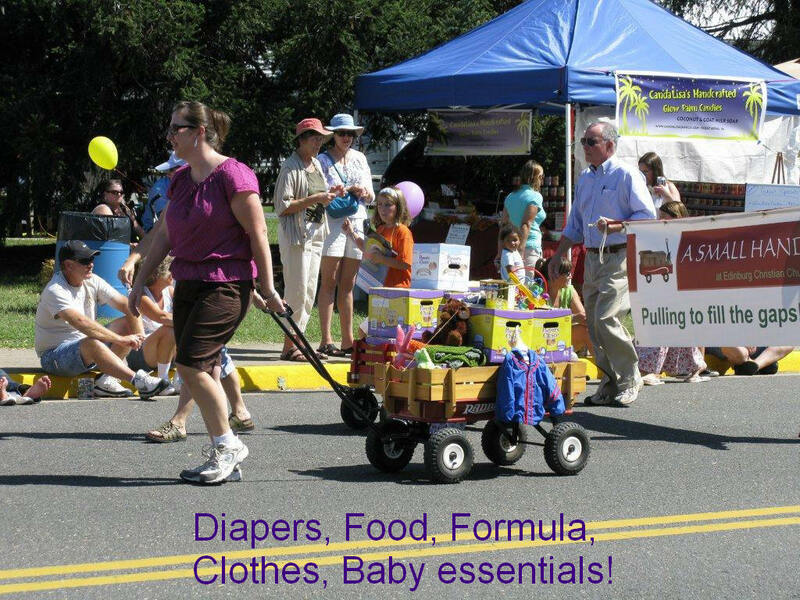 The Virginia Discipes Women for their donation of $1641.23 and for their many gifts of baby essentials during their project year. Thank you all. J&DC for their gift of $75. JC for her gift of $150. The First Christian Church of Girard, Ohio, and Girard First United Methodist Church for despatching a mission trip to help us. We thank them for their many gifts, their donations of $620 but above all for their outstanding emissaries. Eric for his gift of $10. SS for her gift of $200. SK for her gift of $300. 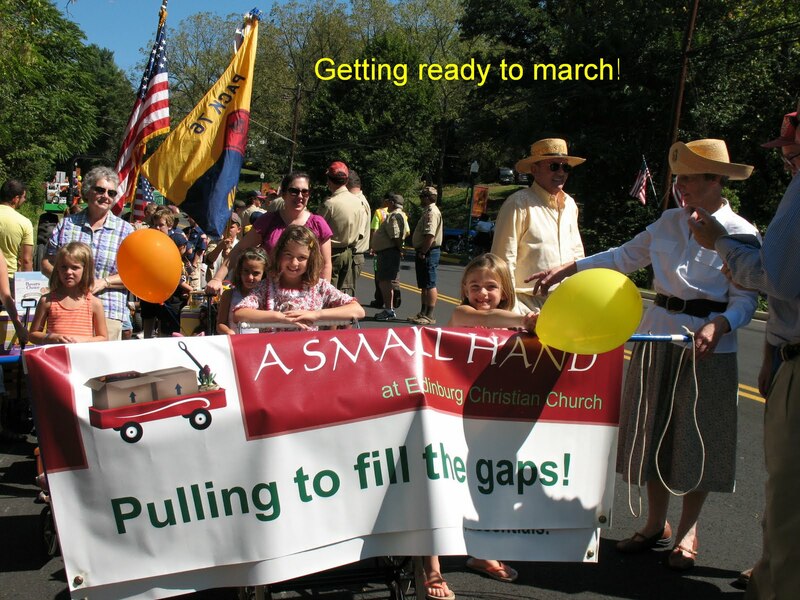 Laurel Hill Christian Church who held an auction for A SMALL HAND and raised $1510. Toms Brook UMC for their May Giving of $65. C&HWH for their gift of $50. Donor designated giving from United Way of Northern Shenandoah Valley of $55.90. The Kiwanis Club of Strasburg for their donation of $70. The Youth Group of the First Church of Columbia Furnace for their donation of $100. F&JW for their gift in honor of Zach Herbaugh's graduation. Hamburg Ruritan Club for their gift of $125. TA for her gift of $100. BJH for her donation of $500. RDS for her donation of $300. W&MP for their donation of $500. JD for her donation of $100. JC for her donation of $225. WALMART Foundation and The Woodstock Supercenter for their grant of $1500. WALMART Foundation and The Mt Crawford Distribution Center for their grant of $700. Woodstock Christian Church CMF for their donation of $100. Women of the Otterbein United Methodist Church for their gift of $350. Zion Christian Church Happy Hustlers for their donation of $200. The Maurertown Brethren Church Mother-Daughter Supper for donations of $100 and a box of baby essentials. Beta Sigma Phi, Woodstock Eta Chi Chapter, for their regular support and donation of $100. Maur-Brook-Olive Ruritan Club for showering our children with bags of essentials and for donations of $145. Delaney, Chloe, Kalista and Bailey for making and selling bracelets that raised $19.09 for A Small Hand. Toms Brook UMC for their March Giving of $202. Edinburg Christian Church CWF for all their help, and for their donation of $400. The Reformation Lutheran Church of New Market for their constant help and their donation of $500. The St Luke Fairview Ruritans for their gift of $200. J&DC for their gift of $225. The Kiwanis Club of Strasburg for their monthly donation of $70. Toms Brook UMC for their February Giving of $35, and for their Lenten Goods Collection for us. Cargill Cares Council, Timberville for their donation of $200. George's, Edinburg for their donation of $250. TA for her gift of $150. Zion Lutheran Church for their donation of $25. JC&DC for their constant help and gifts of $275. The Virginia Association for Early Childhood Education (Valley Chapter) for their donation of $100. 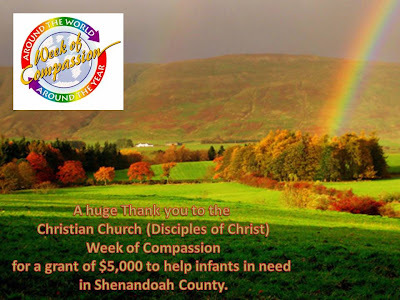 The Christian Church (Disciples of Christ) Week of Compassion for an emergency grant of $1500. The Basye, Bryce Mountain Lion's Club for their annual budgeted donation of $300. Virginia Christian Church (Disciples of Christ) District 11 for their Assembly donation of $425. JT&NT for their gift of $20. 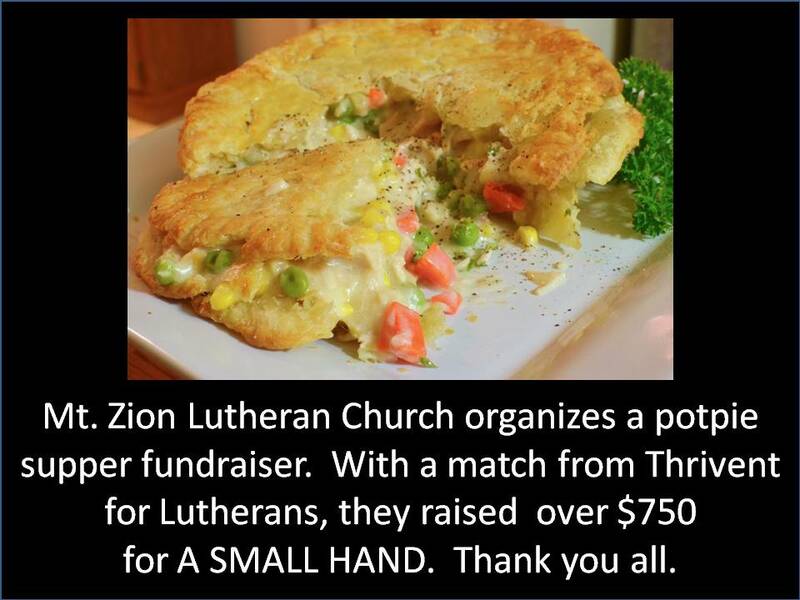 Zion Lutheran Church for their Souper Bowl of caring donations of money and baby essentials. Cedar Creek Valley Ruritan Club for their gift of $100. A Richmond Foundation which asks to remain anonymous for a grant of $20,000 and their pivotal help. TT for his donation of $2000. MS for her gift of $34.87. Maurertown Brethren Church for their donation of $473.03. District 11 Christian Church Mens Fellowship for a Fall Harvest Grant of $2000. Cedar Creek Christian Church for their donation of $318. Toms Brook UMC for their gift of $35. Zion Lutheran Church for their donation of $284. The Clothes Closet, Woodstock, for their donation of $100. 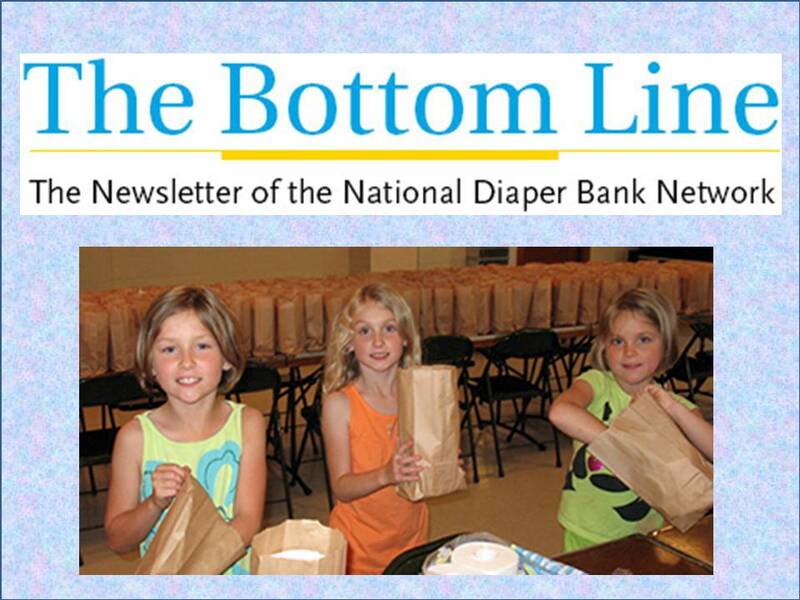 OF THE NATIONAL DIAPER BANK NETWORK. Toms Brook United Methodist Church for their November Offering of $30. The friends of Ola Mae Peer for In Memoriam donations of $100. GW for his gift of $20. NT for her gift of $20. W&LD for their gift of $50. CH for her gift of $100. The Kiwanis Club of Strasburg for their gift of $70. The St. Andrews Guild, Mount Jackson for their gift of $100. D&D for their gift of $500 in memory of Haskell and Fern McBroom. K&MW for their donation of $1000. D&JC for their combined gifts of $200. B&DC for their gift of $100. AM for her gift of blamkets and $100. CB for her donation of $109.99. BP for her donation of books and $25. C&CA for their gift of $500 in honor of Judy and Tim Beechy. F&JW for their gift of $100. SH for her gift of $50 in honor of Clara Hamlett. EC&MC for their gift of $500. The Bryce Ladies Sewing Club for their gift of $402. The Massanutten Antique Tractor and Gasoline Engine Club for their wonderful help over the years and for their gift of $566. Toms Brook United Methodist Church for their October Offering of $35. D&D for their donation of $500 in memory of Haskell and Fern McBroom. The Ronald McDonald Foundation for a grant of $2500. 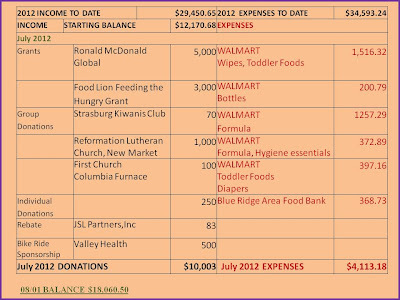 The WALMART foundation for a grant of $1000 from Store #3344. CH for her gift of $50. The Reformation Lutheran Church of New Market for their repeated help this year and for their grant of $575. Toms Brook United Methodist Church for their September Offering of $65. The Mangement and Staff of Mt. Jackson BB&T for selecting A Small Hand as their Lighthouse Project, and for filling our baskets with baby essentials. Ebenezer Christian Church, Gore, for their gifts for our children and donations of $85. J&DC for their staunch support and gift of $175. The Christian Church District 11 Assembly for a donation of $100. The friends and family of Ola Mae Peer for In Memoriam donations of $580. The Kiwanis Club of Strasburg for their monthly doantion of $70. The Valley Foundation for being wonderful friends, for their hard work at Shenandoah County Fair and for their donation of $1350. The Ronald McDonald House Charities of Greater Washington DC for a grant of $2500. The First Methodist and First Christian Churches of Girard Ohio for their gift of $1000. The New Market Family and Community Education Club for their gift of $25. LP for her donation of $25. T&V M for their gift of $100. J&D C for their gift of $200. Toms Brook UMC for their July Giving donation of $65. The Stasburg Kiwanis Club for their monthly donation for July and August of $140. Wakemans Grove Church of the Brethren for their Vacation Bible School collection of $1,023.31 - thank you children, families and staff. Woodstock United Methodist Church Missions Committee for their gift of $275. F&JW for their Birthday Gift of $300. The Food Lion Charitable Foundation for a grant of $4,000. This is our third year of help and we are truly very grateful. J&DC for their gift of $180. NC for his gift of $30. B&KJ for their gift of $20. Pioneer Hi-Bred International for a Food Security Grant of $5,000. The Happy Hustlers of Zion Christian Church CWF for their gift of $100. The Cedar Creek Valley Ruritan Club for a donation of $100. for a gift of $50. Toms Brook UMC for their constant help and monthly giving of $65. The Stasburg Kiwanis Club for their monthly donation of $70. The Beta Sigma Phi Sorority of Woodstock for their gift of $400 and their constant help over the years. Christ Church Episcopal, Glen Allen, Virginia for their donation of $678 as part of their Great Big Charity Check-a-Thon, and to Kalista and Delaney for nominating A Small Hand. 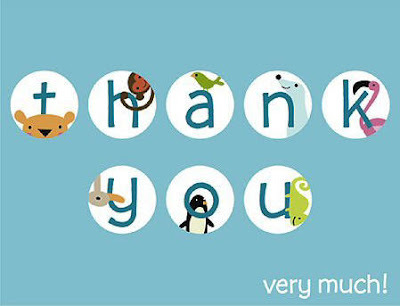 To the organizers of and donors to the Shenandoah Memorial Hospital Community Baby Shower which provided us with clothing, diapers, baby essentials and $14 in cash. The Walmart Foundation for a Community Giving grant of $1500 from the Woodstock SuperCenter. Thank you to all involved. The Edinburg Christian Church CWF for their gift of $400. The Strasburg Kiwanis for their monthly donation of $70. C&HW H for their gift of $50. The MAUR-BROOK-OLIVE Ruritan Club for a donation of $200. 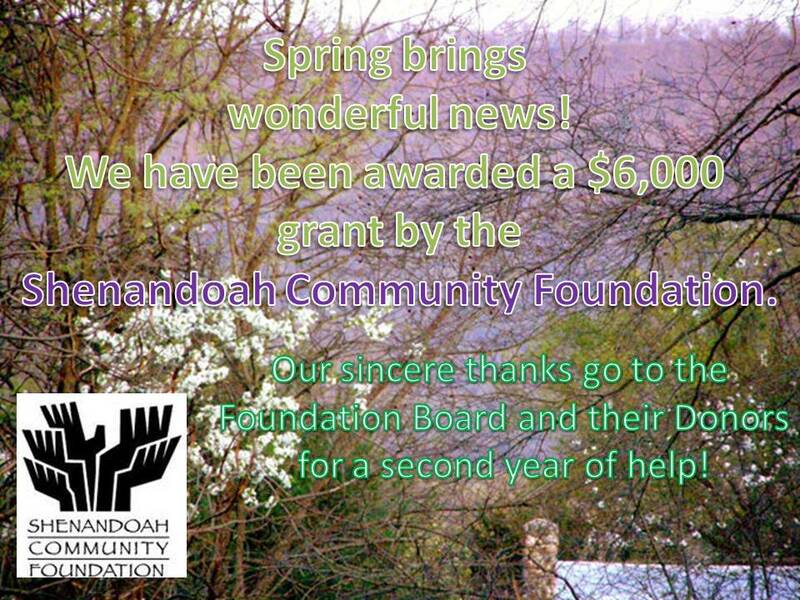 The Shenandoah Community Foundation for a 2012-2013 Grant of $10,000, funded by a donation from Woodstock Anonymous. Thank you all for your trust and support. 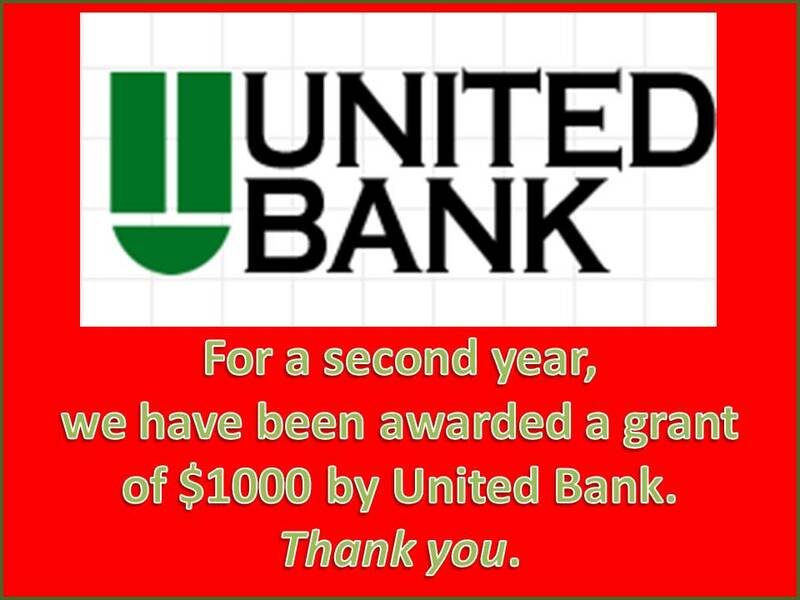 United Bank for a grant of $250. J&KP for their gift of $20. J&DC for their gift of $208. Toms Brook UMC for their constant help and March Giving of $75. Reformation Lutheran Church, New Market, for a donation of $1000. Thank you for a second year of help. P&JW for their gift of $100 and for much help since we opened. The Hamburg Ruritans for a surprize collection of baby goods and contributions for A Small Hand at their March 5th meeting. They generously donated three bags of baby essentials and $185 for which we are extremely grateful. A special Thank you to Deanna Fritz who initiated the idea. The St. Luke Fairview Ruritan Club for their donation of $200 in memory of Oliver Peer. Toms Brook UMC for their February Offering of $65. 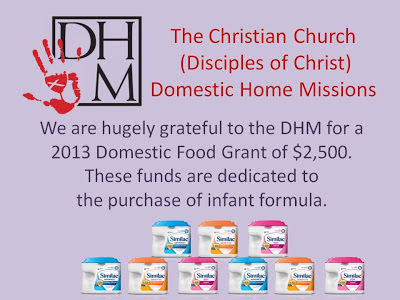 The Christian Church (Disciples of Christ) Disciples Home Missions for the award of a $2500 Domestic Food Grant to purchase infant formula. The Woodstock Clothes Closet for their donation of $250 and for their consistent help over the past three years. D&JC for their gift of $200. The Rhodes family for their generous donation of baby essentials, clothing and toys. Toms Brook UMC for their generous collection of baby essentials in conjunction with their Lenten Meal Program. The Kiwanis Club of Strasburg for their monthly donation of $70, and for your hard work on February 9th. The Hamburg Ruritan Club for their donation of $125 in memory of Oliver Peer. MM for his donation of $250. Toms Brook UMC for their January Offering of $65. The District 11 Mens Fellowship of the Christian Church Disciples for a Fall Harvest Grant of $1000. The Seventh Street Christian Church Foundation Inc. Richmond for a donation of $10,000, and for their willingness to support a distant outreach program. The congregation of Christ Church, Front Royal for their generous gift of $3,000 as they disband. Thank you for your staunch help, and every blessing for the future. The quilters of The Shenandoah Valley Quilters Guild, The Piece Maker Quilters and the Quilters of Mt. Hermn UMC who put so much skill, creativity and work into generating beasutiful quilts for our babies and toddlers. Christ Church, Front Royal for their monthly offerings of $100. LDW for her gift of $125. The FCCLA of Central High School for their donation of diapers. The congregation of Toms Brook UMC for their Giving Tree donations of clothing and toys. The FCCLA of Strasburg High School for their Christmas drive to collect clothing, baby food and baby essentials. The crafters of Peter Muhlenberg Middle School and their teacher Ms Dysart for their beautiful handmade hats and blankets and donations of baby goods. The Basye Bryce Mountain Lions for their budgeted donation of $300. Maurertown Brethren Church for their fonation of $592.46. WL&BL D for their donation of $50. Toms Brook UMC for their November Offering of $30. The members of the Beta Sigma Phi Sorority of Woodstock (Eta Chi Chapter) for their wonderful help since we opened and for their donation of Christmas books for our children. Thank you for everything! Everyone involved at Mt. 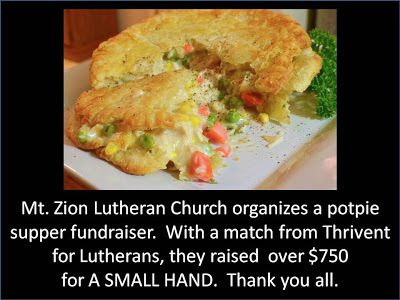 Zion Lutheran Church for organizing a Ham Potpie Supper which (with a match from Thrivent for Lutherans) raised $759.50 for A Small Hand. 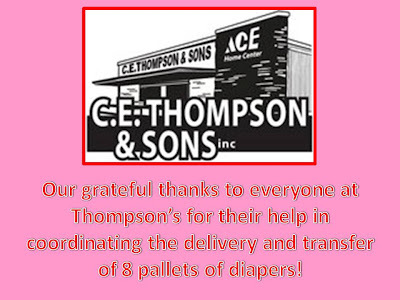 We are very grateful for all your hard work. $100 in honor of Natalie Alice Vinias - born December 10th 2012. AM for her gifts of crochet blankets and $100. SM for her gift of $25. The Rhodes Family for their Christmas Family Gift of $100. The Bryce Ladies Seing Club for their gift of $410. F&JW for their donation of $200. DCPD for her gift of $150. JH for her gift of $40. BD for her gift of $50. Shenandoah Valley Electric Cooperative, Inc. for a donation of $50. The Kiwanis of Strasburg for their monthly donation of $70. TS for a $5 donation to Glenna's Raffle. Southside Youth Festival, Burkeville, Virginia for their gift of $50 in honor of Zoe Shreck. The First Church of Columbia Furnace for their regular support and gift of $100. S&BD for their donation of $50. HWH for her donation of $200. Christ Church, Front Royal for their monthly donation of $50 and for a special offering of $50. B&BL C for their donation of $100. The Fort Valley Ruritan Club for their donation of $300. Otterbein Chapel United Methodist Women for their donation of $50. Christ Church, Front Royal for their monthly offering of $50. The Edinburg Association Family Community Education Club for their donation of $50. K&RC for their donation of $1000. Toms Brook UMC for a monthly offering of $30. LDW for her gift of $86. The Kiwanis of Stasburg for their staunch help and donation of $70. The Staff of Central High School for their donation of $1,065. IDB and JVD for their donation of $50 in honor of Uncle Dan. Strasburg Kiwanis Club for their their gift of $70. The Massanutten Antique Tracor and Gasoline Engine Club for their constant support and their donation of $360. Strasburg Christian Church Outreach Committee for a donation of $73. Glenna for her hard work in organizing a raffle which, with the help of generous donors and participants, raised $700. Everyone involved in making Pastor Eric's Ride for Diapers through Shenandoah County such a memorable day, including the cyclists who rode with him, the children who cheered them on, the Day Care staff who shepherded the children, and Sheriff Carter and Deputy Justin who kept us all safe. Christ Church, Front Royal, for their monthly donation of $50. JV for his gift of $50. WL&BL for their gift of $25. SC for her gift of $25. PTF&WBF for their donation of $100.The Valley Foundation for their grant of $4,000. 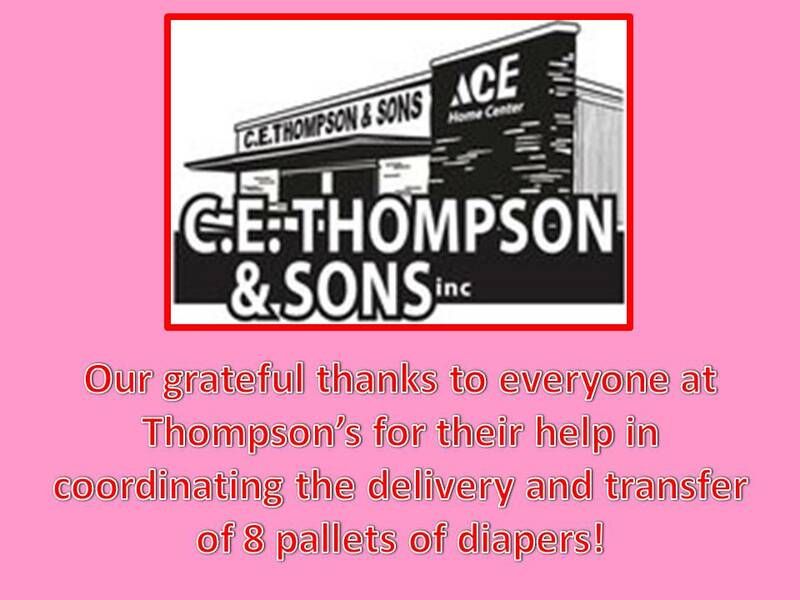 Thank you for your hard work and for your wonderful help! Strasburg Kiwanis Club for their unfailing support, and their gift of $70. J&DC for their donation of $200. Hamburg Ruritan Club members for their donation of $75. Toms Brook United Methodist Church for their July Giving donation of $30. The Walmart Foundation for a grant of $1,000 provided as a Community Grant from Woodstock SuperCenter #2647.The Edinburg Christian Church Yard Sellers who raised $899.63 for A Small Hand; thank you to all who gave and all who bought.Christ Church, Front Royal for their June, July and August Monthly Givings totaling $150.W&MG for their gift of $100.J&FW for their gift of $200. The Reformation Lutheran Church of New Market for their donation of $1,000. 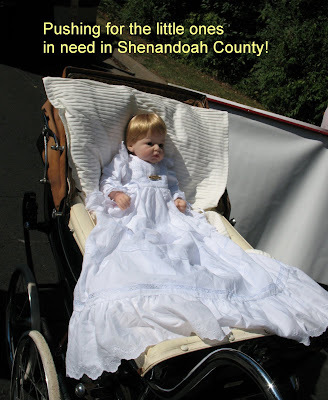 Shenandoah Memorial Hospital for being the first sponsors of our 'Riding for Diapers in Shenandoah County' event and for their $500 sponsorship. The Ronald McDonald House Charities of Greater Washington, DC and RMHC Global for a grant of $10,000 to keep our shelves stocked with formula, food, diapers and essentials. This represents funding for two months of operation, and we are hugely grateful. Food Lion Foundation for a 2012 Feeding the Hungry Grant of $3000. 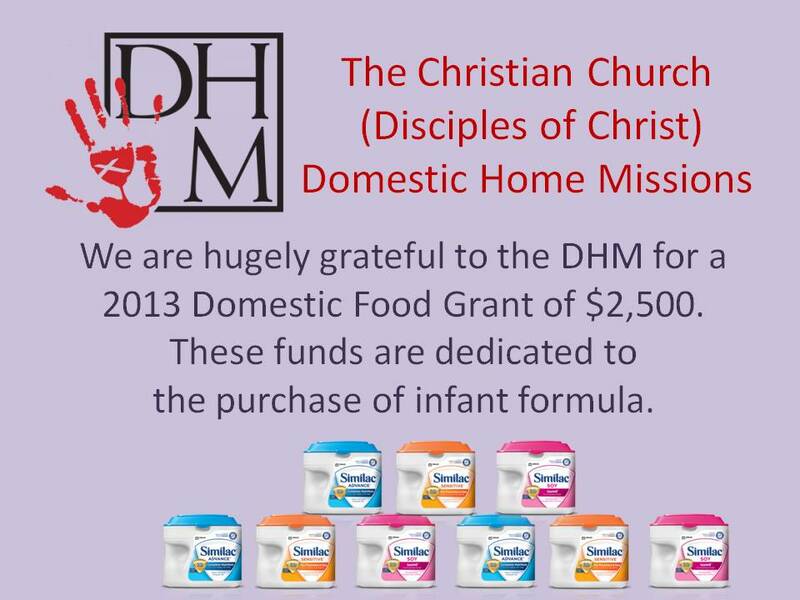 These funds are dsignated for purchases of formula and food items. We are very grateful for a second year of funding from the Food Lion Foundation. The Walmart Foundation for a grant of $1,000 provided as a Community Grant from The Mt. Crawford Distribution Center #7045. Beta Sigma Phi Sorority of Woodstock (Eta Chi Chapter) for their wonderful help since we opened and for their donation of $625 - Thank you for everything! 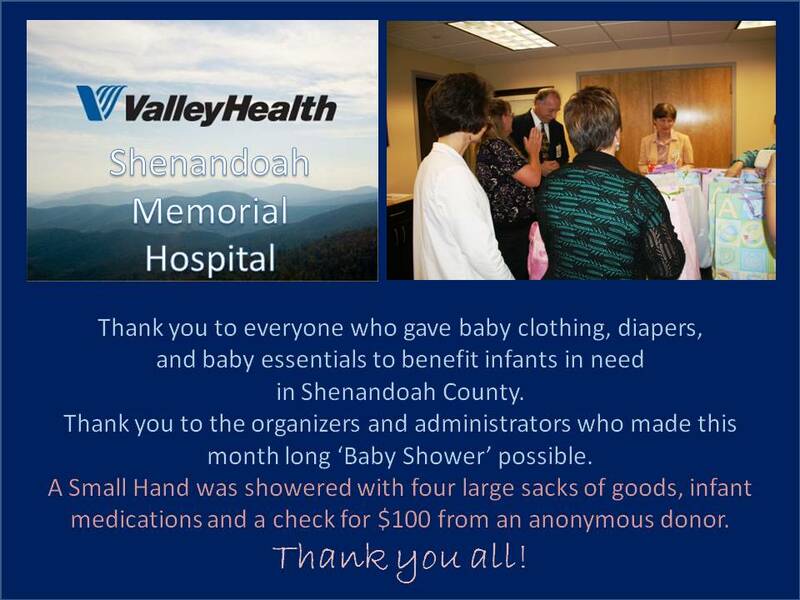 Shenandoah Memorial Hospital/Valley Health for organizing a month long Baby Shower to benefit needy infants in Shenandoah County, and to the many people who gave their time and goods to make this a success. 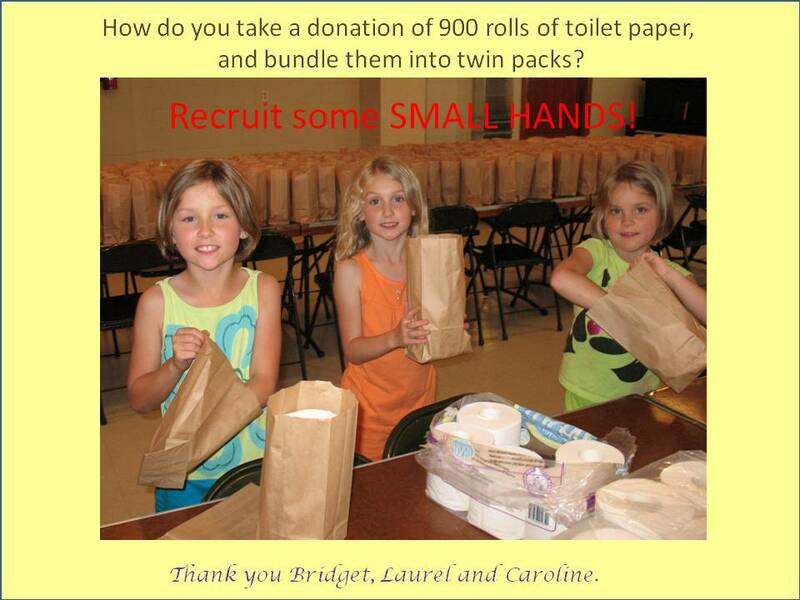 Thank you to the anonymous donor who gave a gift of $100 to A Small Hand. Strasburg Kiwanis Club for their faithful support and their donation of $70. Toms Brook UMC for their May Giving donation of $30.The Prince of Peace Lutheran Church, Basye for their gift in memory of Vivian Moomaw. Donations in memory of Vivian Moomaw $120. Mount Jackson Lioness Club for their gift of $400, and for all they have done over the years to serve and enhance our community. The quilters of The Quilters Cabin in Woodstock, VA for a second wonderful set of quilts for babies in special need. 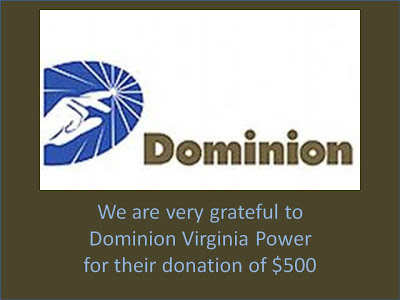 Dominion Virginia Power for their donation of $500. Strasburg Kiwanis Club for their donation of $70. The Women of Mt. 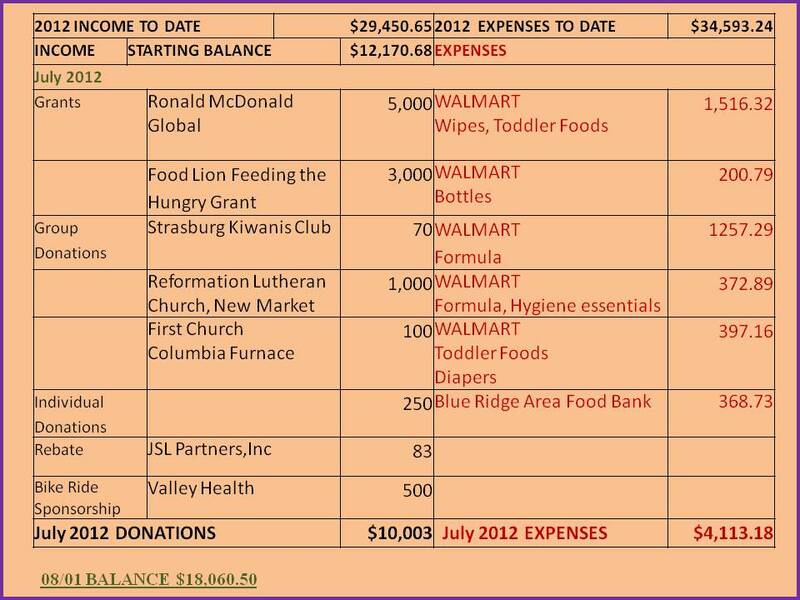 Hermon UMC for showering us with baby essentials, and for monetary donations of $302.50. LW for a gift of $100. St Andrew's Episcopal Church, Mt. Jackson for their donation of $750.Zion Christian Church Happy Hustlers for their gift of $100. 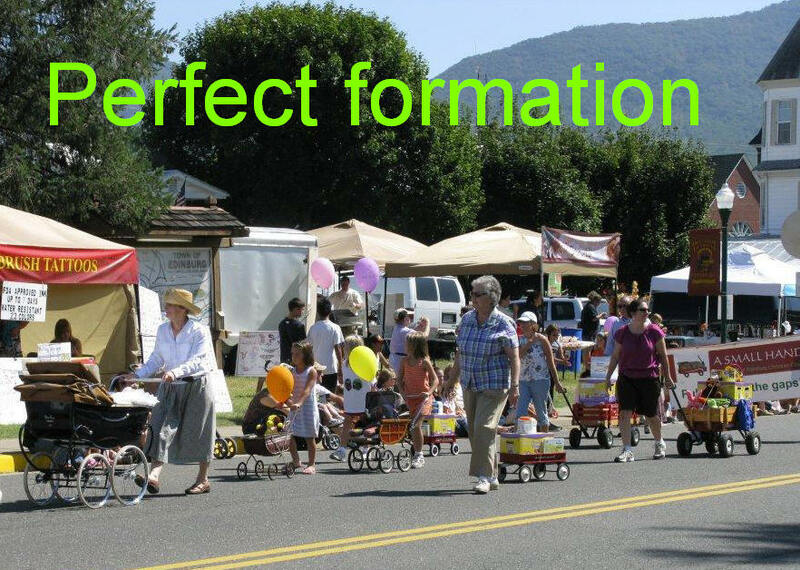 The Valley Foundation for a deposit of $1000 in our Blue Ridge Area Food Bank account. Donations in memory of Ethel Wisman, $65. 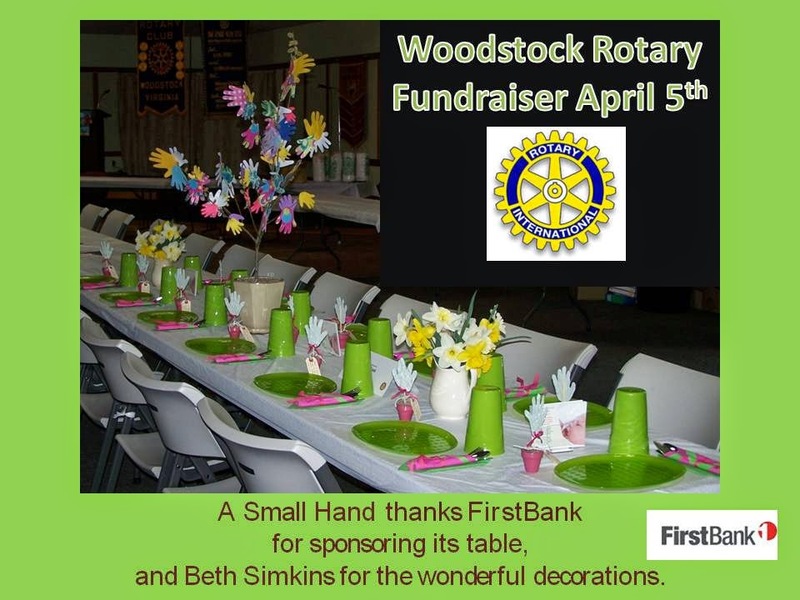 The Shenandoah Community Foundation for a grant of $6000 provided by 'Woodstock Anonymous' - our sincere thanks go to the donor for his/her generous support and to the foundation for their pivotal assistance. 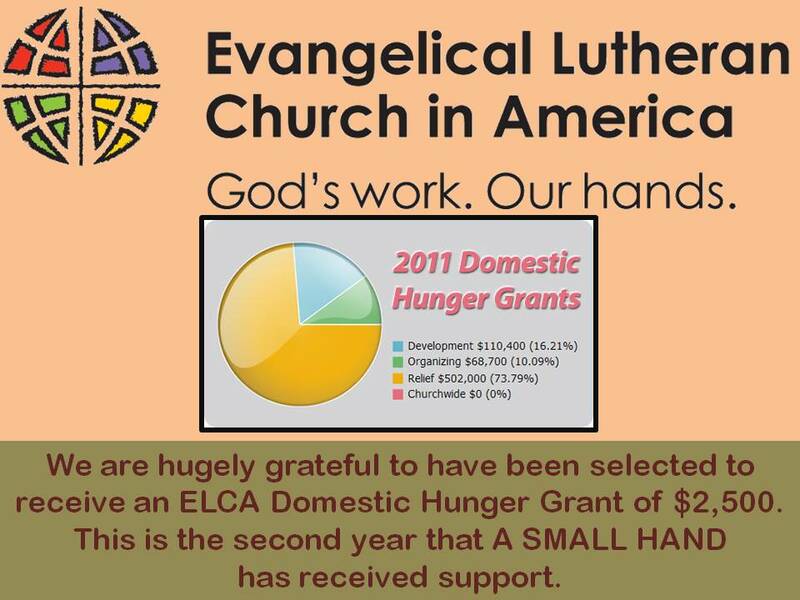 The Evangelical Lutheran Church in America for a Domestic Hunger Grant of $2500. The Mt. Jackson Lioness Club for their donation of $50. Donations in memory of George Grandstaff, $135. Donations in memory of Ethel Wisman, $165. Edinburg Christian Church CWF for their gift of $400. Tom's Brook United Methodist Church for their gift of $15. First Church of Columbia Furnace for a Nurture and Outreach donation of $100. Strasburg Kiwanis Club for their consistent help and donation of $70. Tom's Brook United Methodist Church for their gift of $50. The Christian Church (Disciples of Christ) for a sustainable development grant of $5,000 from their Week of Compassion funds. 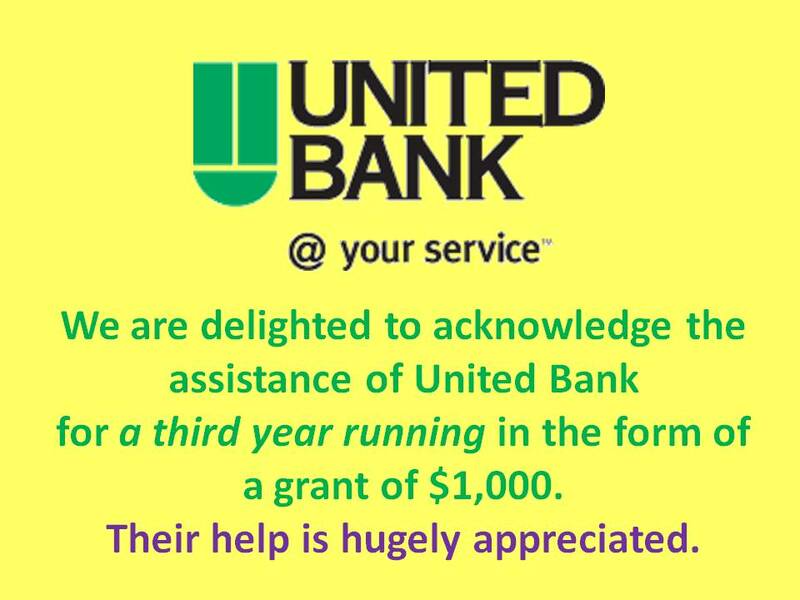 United Bank for a grant of $1,000; and to Ingrid Thompson for her readiness to help.The Woodstock Clothes Closet for all of their help since we opened and for their donation of $400. 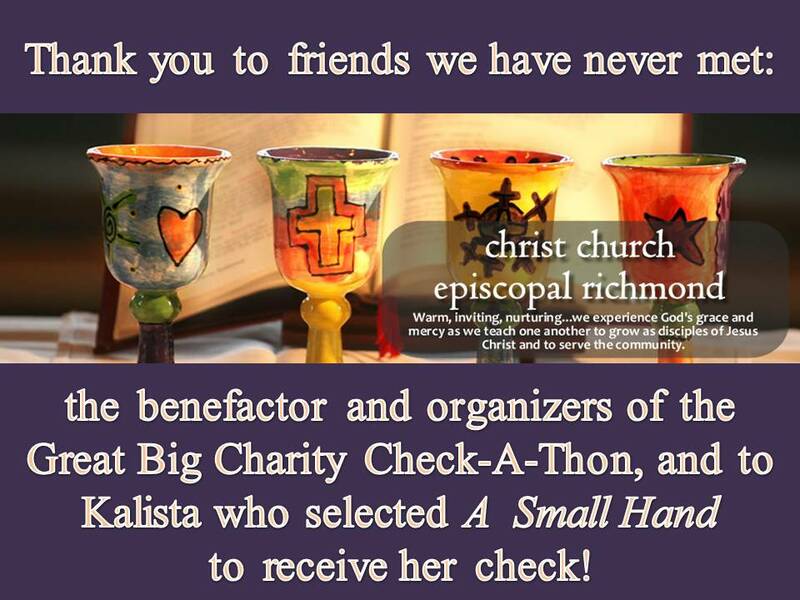 Christ Church Episcopal, Glen Allen, Virginia for their donation of $241 - Kalista's 'share' in their Great Big Charity Check-A-Thon. Thank you all! The Strasburg Kiwania Club for their gift of $70. J&DC for their gifts of $450. LC for her gift of $60. R&JB for their gift of $100. TA for her gift of $50. The Walmart Foundation for a grant of $1,000 provided as a Community Grant from Winchester Store #3344. Tom's Brook UMC for 'showering' us with baby essentials at their 29th February Lenten Meal and for their gift of $291.R&TB for their gift of $50 in honor of Ona Evans. The Basye, Bryce Mountain Lions Club for their budgeted donation of $300.LDW for her gift of $100. The Strasburg Kiwanis Club for their constant help, and donation of $35. The District 11 CMF for their Fall Harvest Grant of $783.17. 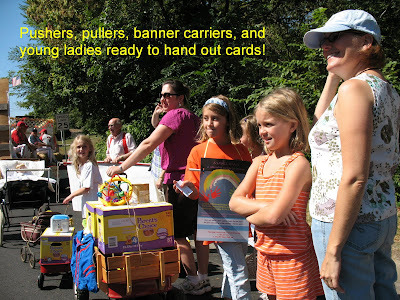 The Shenandoah Valley Quilters Guild BEE for their gift of baby quilts and fabric books. 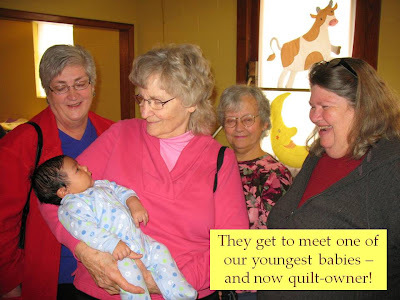 The Dorcas Circle of Woodstock United Methodist Church for their gift of baby quilts. The FCCLA of Strasburg High School, and their leader Heather Hiserman, for their wonderful drive on behalf of our infants which brought in $5,306 worth of donated clothing and baby essentials. The day before Pastor Eric Shadle completed his 37000 ride across America, he rode through Shenandoah County. To Sheriff Carter and his deputies for escorting the ride and riding the ride! To all our Riders and Cheerers! To The Edinburg Mill for welcoming us. To the Free Press and The Northern Virginia Daily for covering the event. for which we are very grateful. In rural Shenandoah County, Virginia, there are few large corporations or wealthy individuals that A Small Hand can approach for support. But there is no end of need. “So far, our donations, whether it’s money or goods, have just kept ahead of demand,” said Executive Director Ann McBroom. She founded A Small Hand three years ago on the model of Infant Crisis Services, which she learned about while visiting her daughter in Oklahoma City. A Small Hand provides diapers, formula, food and gently used clothes for babies in low-income families. It is one of the few social service agencies in its area, so Ann cannot refer families to another agency when her supplies are low. 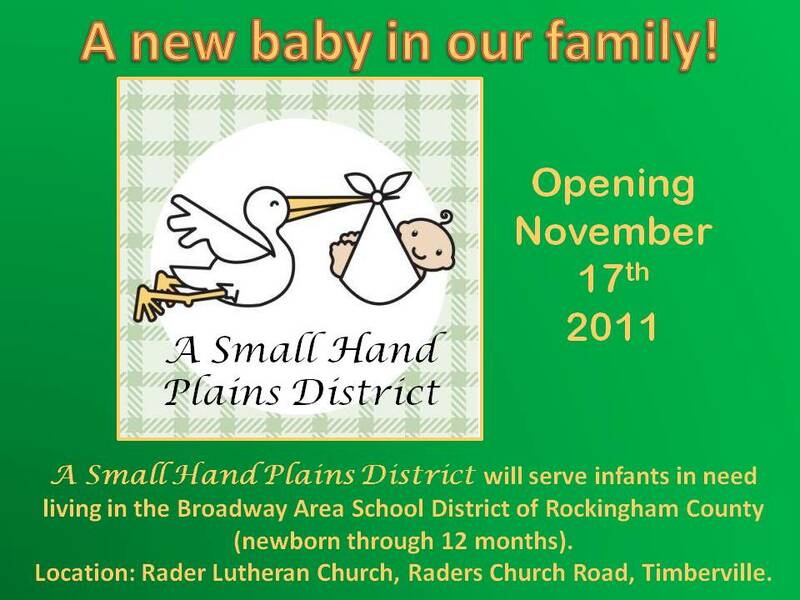 Just getting to A Small Hand can be a large feat for some families. It could be a 30-mile drive for parents who live on the other side of the county. A typical family comes in twice a month, but A Small Hand serves some weekly. The families face enormous struggles with grace, Ann says. There are about 15 families with a disabled parent or child. “We have some stellar grandparents who have taken in children even though they don’t have the financial resources to do it,” she says. Uncles and neighbors in poverty themselves have nevertheless stepped up to care for children whose parents are not able. Sometimes Ann dreams of a large donor who will give A Small Hand financial security. But she knows that dream is unlikely to become a reality. “We’re living hand-to-mouth,” she says. 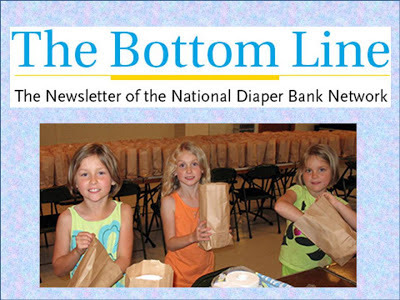 “We’re just doing what our families are doing.” s get diapers and invaluable technical assistance to diaper banks across the country. The friends and family of Ona Evans and Jean Neff for their gifts in memory of these wonderful ladies. The Worthwhile Sunday School Class of St. John's UMC Edinburg for their gift of $90. The congregation of Columbia Furnace UMC for their SLIM CHRISTMAS donation of $945. RD for her gift of $100. F&J W for their donation of $200. I&RS for their gift of $100. The Strasburg Kiwanis Club for their donation of $35. DH for her gift of $200. J&D C for their gift of $186. D&M H for their gift of $100. FirstBank Strasburg for hosting our quilt and selling raffle tickets. TJM for his gift of 25. Judy and Clyde Beachy for their gift in honor of their children,Tim and Cindy, son-in-law Craig, grandchildren Lauren, Rob and Lindsey (and her husband Dennis). DH for her gift in honor of Ethel Wisman, the Beachy family and Maxine Pence. The Bryce Ladies Sewing Club for their donation of $388.80 collected by selling their beautiful hand-made items. The Grabill Family for their Christmas Donation of formula, baby foods, diapers and hygiene essentials. The Mount Calvary Lutheran Church, Mount Jackson, for their very successful Christmas Drive to collect clothing, baby foods and baby essentials. The Kiwanis Club of Strasburg for their donation of $35. The Shenandoah Community Fellowship Prime Timers for their gifts of baby essentials. Woodstock Moose Lodge Number 575, Woodstock, for a grant of $1000. KB, Winchester, for her gift of $13. Judy Cooley for her wonderful support and for a sleuth of her handcrafted Bears! First Church of Columbia Furnace, Woodstock, Nurture and Outreach Committee for their gift of $100. Community Mission Church of the Brethren, Woodstock, for their gift of $100. FirstBank, Mt. Jackson for hosting our quilt and selling raffle tickets. The Regulus Group, Woodstock for their oranization of the 2011 Woodstock Turkey Trot, to their sponsors and trotters and to everyone who made this event such a success. The outcome was a $5000 donation to A Small Hand. Meghann Eastham, her family and friends for donations of baby essentials and clothing in honor of Jack's First Birthday. BS for her gift of $1000. LW, Woodstock for her gift of $85. F&J W, Basye for their gift of $200. RH, Strasburg for his gift of $90. The WalMart Distribution Center Mt. Crawford - Facility #7045 and the WALMART Foundation for a Hunger/Community Outreach Grant of $1000. KS for her gift of $6. The Mt Olive United Methodist Women, Toms Brook, for their gift of $300. J&D C for their donation of $1000 and for their never-failing support. The Shenandoah Valley Quilters Guild for showering us with dozens of beautiful hand-crafted quilts for our children in special circumstances, soft bags and pillows, much clothing and baby essentials. Thank you for bringing color into our children's lives. The Strasburg Kiwanis Club for their donation of $35, and for their commitment to help us. The Vacation Bible School children of Woodstock UMC for their gift of $260. The Banking Team at First Bank, Woodtock, for hosting our quilt and selling 72 raffle tickets. 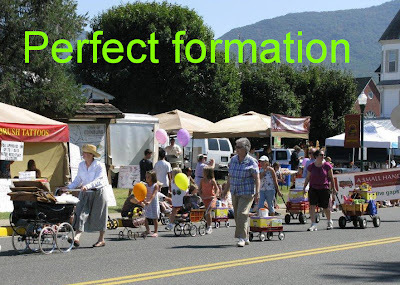 The congregation of St. Andrew's Episcopal Church, Mt. Jackson, for their donation of $210 from their Spring Thank Offering. Otterbein Chapel United Methodist Church Women for their gift of $50. The Edinburg Association Family Community Education Club for their gift of board books for our book box. J&P B for their gift of $300; and for their wonderful thoughtfulness. BB&T, Woodstock, for their donation of $1000's worth of baby formula, baby foods and baby essentials through the bank's Annual Lighthouse Project.FirstBank Woodstock for hosting our quilt during the month of July and for their willingness to sell tickets. Lisa Dubbelde and Abbott Nutrition for their donation of fifty $5 Manufacturer Coupons to purchase SIMILAC formula. JH for her gift of $20. Patricia Bladt and Debra Mueller for their gifts of knitted and crocheted baby blankets, hats, bonnets and scarves. First Church of Columbia Furnace Nurture and Outreach for their donation of $100. J&D C for their gift of $310, and for their wonderful support. 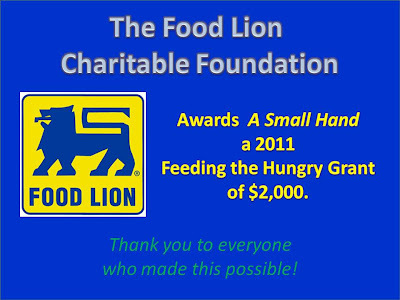 Food Lion Charitable Foundation Inc. for a 2011 Feeding the Hungry grant of $2,000. RR for her gift of $6. KAM for her gift of $50. Strasburg High School FCCLA for collecting 533 items of gently-used clothing, valued at $3,424. The Hamburg Ruritan Club for their donation of $25. The District Churches who met at Mt. 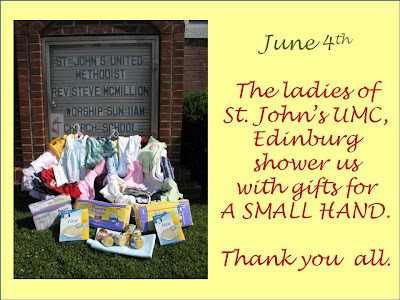 Hermon UMC on June 6th for a program that included 'showering' A SMALL HAND with $442 in monetary donations and 322 baby items (conservatively valued at $1505). We are hugely indebted to the organizers and everyone who participated. Mercury Paper Inc., Strasburg, for their donation of 5760 rolls of toilet paper; and to Bob Nelson for his generous help. The Kiwaniis Club of Strasburg for their donation of $35 and their constant support. JC for her gift of $306. St. Jacob's Lutheran Church, Edinburg for organizing a chicken BBQ as a community outreach project and for raising $539.72 to support the mission of A SMALL HAND. Thank you for your trust, your help and for your hard work. WalMart Supercenter #3344, Winchester, and the WALMART Foundation for a Hunger/Community Outreach Grant of $250. The Happy Hustlers Sunday School Group, Zion Christian Church, Maurertown, for their gift of $50. The Kiwanis Club of Strasburg for all their help and for their donation of $35. WG&LG for their gift of $100. JC for her gift of $240. RHH&DLH for their gift of $100. WalMart Supercenter Woodstock for selecting A SMALL HAND to receive $250 from their WalMart Foundation Local Community Contribution/Hunger Outreach Grant allocation. WG&LG for their gift of $60. The Beta Sigma Phi Sorority of Woodstock for their persistent interest and support and for their donation of $600. The Kiwanis Club, Strasburg, for their ongoing support and donation of $35. C&E for their gift of $50. C&P W for their ongoing help and for their gift of $50. The Bladt and Ballard families for their gift of hand knitted baby caps. The Regulus Group LLC Woodstock for their wonderful support and for their gift of baby essentials.JC for her trust and enthusiasm, and her gift of $345. District 11 CMF for their donation of $195. 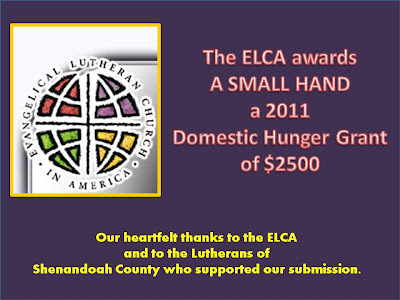 Shenandoah Community Foundation for awarding A Small Hand a grant of $3000. 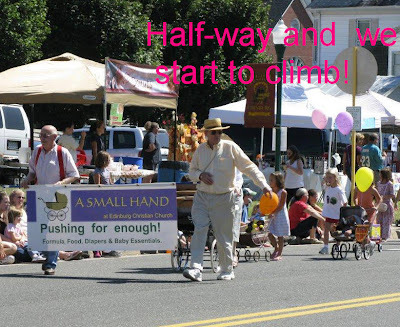 The Valley Foundation for awarding A Small Hand a grant of $7500. The Kiwanis Club, Strasburg, for their constant help and a donation of $32. Farmers & Merchants Bank for their donation of $250.Week of Compassion, The Christian Church (Disciples of Christ), Indianapolis, Indiana for a $5000 2011 Sustainable Development Grant. The Toothman family for their donations of infant essentials and hand crocheted blanket and squares.Mary Shipp for keeping our shelves stocked with hand crocheted baby caps. MMI for her gift of $20. St. Luke Fairview Ruritans for their donation of $200. RAH for his gift of $90. The Shenandoah Valley Quilters Guild for their donations of baby quilts, a queen-size quilt and $500. Revelers at the St. Patrick's Day Celebration May 19th for their donations of baby essentials. The Clothes Closet, Woodstock, for its donation of $500.The Evangelical Lutheran Church of America for a Domestic Hunger Grant of $2500 to tackle malnutrition in early infancy. 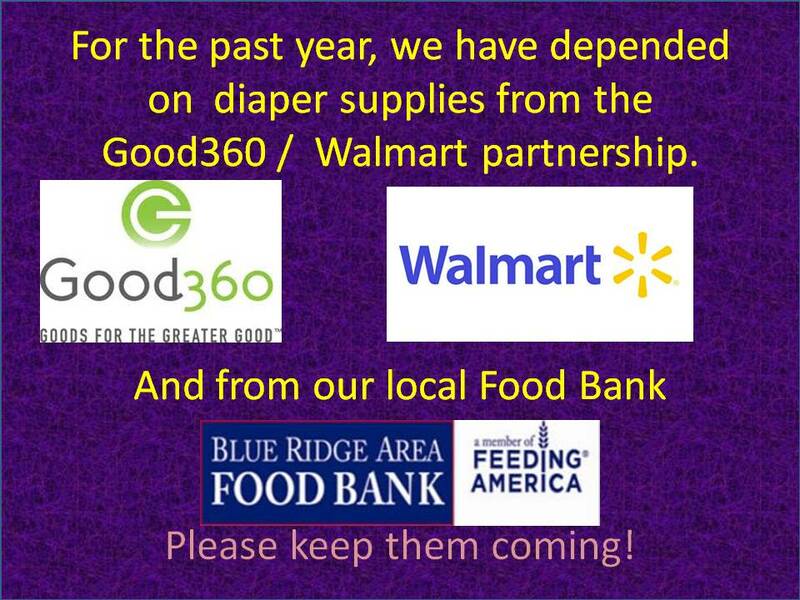 Good360 (previously Gifts in Kind International) for securing donations of disposable diapers. 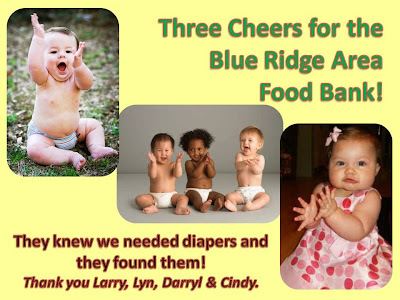 The Blue Ridge Food Bank for securing donations of disposable diapers, and to Cindy Holley for her unfailing helpfulness and efficiency.Nurture and Outreach, First Church of Columbia Furnace, Woodstock VA for their donation of $75. CWF, Walnut Springs Christian Church, Strasburg for their gift of diapers, wet-wipes and baby essentials, and for their ongoing support. Otterbein Chapel United Methodist Women for their gift of $50. Dr Rowland and the Shenandoah County Public Schools for a donation of 93 books. 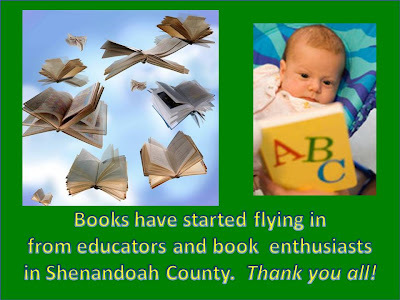 Beth Dirting and friends for a donation of 122 books.JA, Strasburg, for a gift of $100. The XI Epsilon Beta Chapter of the Beta Phi Sorority, Woodstock, for their gift of $50. The District 11 Mens Fellowship of the Christian Church (Disciples of Christ) for a Fall Harvest Grant of $1,036.42; and to Earl Williams for all his hard work. The Kiwanis Club, Strasburg, for their constant support and donation of $32. Judy, Merritt Island, FL for her gift of $140. The Kiwanis Club, Strasburg for their ongoing support and for a donation of $32. The Edinburg Association Family Community Education Club for their gift of $100. Mrs I, Edinburg, for her gift of $50. RS, Woodstock, for her gift of $20. Mercury Paper Inc., Strasburg, for their donation of 3360 rolls of toilet paper; and to Bob Nelson for his readiness to help. their beautiful quilts and for the baby clothes they brought. at the Edinburg Old Time Festival! Thank you to Katie, Judy, Heather, Lynn, Chloe, Savannah, Felicity, Paige, Bridget, Caroline, Laurel, Tim, Steve, Charles and Jack... And to our supporters along the route! in their Scouting for Food Campaign. in an interview with County Conversations. Read all about this project in The Northern Virginia Daily, Jan 5th. N&W Woodstock, for their gift of $25. E,M,L&E Crozet for their gift of $111.28. The Strasburg High School FCCLA for a winter goods drive to stock our shelves with clothing, food and baby essentials. They collected $4,350 worth of goods. The Lord's Chapel, Edinburg for their gift of $500. B&C, Lynchburg for their gift of $50. The Kiwanis Club, Strasburg for their multifaceted support and for a donation of $32. KK, Edinburg for his donation of $90. The Worthwhile Ladies Sunday-School Class, St. John's UMC, Edinburg, for their gift of $145. Visitors to A Small Hand on the Parlor Tours of Edinburg, gifts totalling $22. WAL-MART FOUNDATION Community Grant through the Mt. Crawford Distribution Center, $1000. The CWF of Walnut Springs Christian Church Strasburg for organizing a month long baby shower for our infants. Emergency Families, Northern Valley, and Melana for their generous donation of baby essentials. The Clothes Closet for their continuing support of our mission. Tabatha for adopting A Small Hand for regular help. Jody Stephenson and The Red Wagon Ministry, Winchester, for their interest and practical support. The Boy Scouts of Shenandoah County who collected material for A Small Hand as part of their Scouting for Food campaign in Shenandoah County. St. Jacobs Lutheran Church and The Shenandoah Chapter of Thrivent for Lutherans for a fundraiser and match that resulted in a combined gift of $650.92. The Kiwanis Club, Strasburg, for their constant help, and donation of $32. EW for her gift of $2. 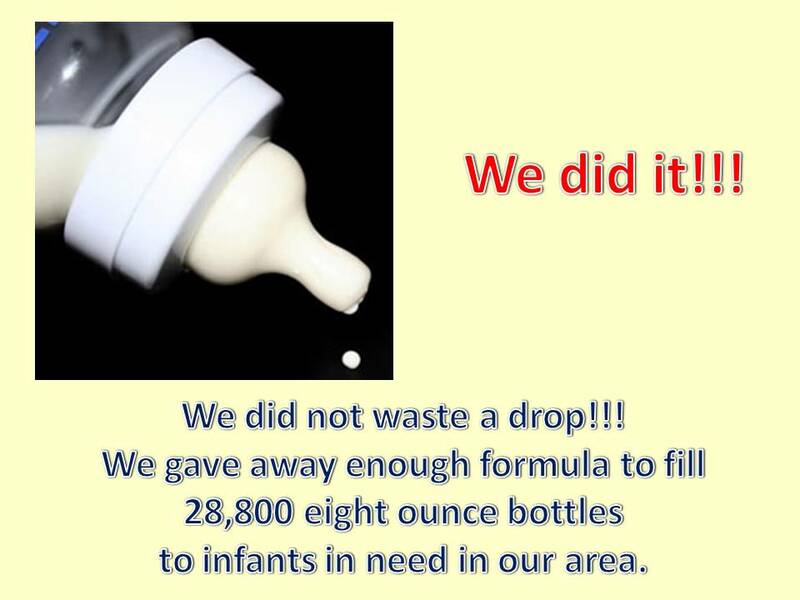 Food Lion LLC for their generous donation of 192 bottles of shampoo, baby wash and baby lotion. WALMART SuperCentre, Front Royal VA for a grant of $500. The Strasburg Kiwanis Club for their ongoing support and donation of $32. The United Methodist Church, Toms Brook for their local mission donation of $250. Rachel for her unflagging support and gift of $10. Strasburg High School FCCLA (Family Career and Community Leaders of America) for brainstorming how to assist A Small Hand; and to Heather Hiserman for her enthusiasm. Judy, Merritt Island, FL for her gifts of $250. 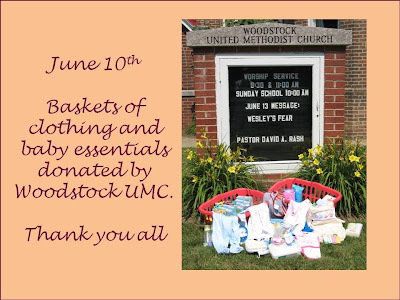 The United Methodist Church, Toms Brook for their gift of $71.84 and a wealth of baby items. The Massanutten Antique Tractor and Gasoline Engine Club, Edinburg for their gift of $75. First Church, Columbia Furnace for their gift of $50. Andrea, Henrico VA for a gift of $50. 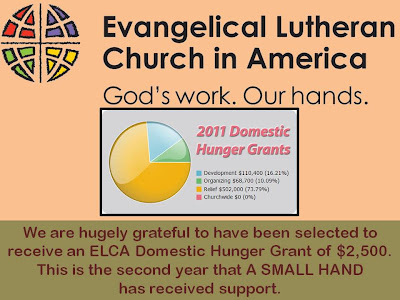 St Paul Lutheran Church (Strasburg) for selecting A Small Hand to receive its Vacation Bible School Offering of $432. Judy, Merritt Island, FL for a gift of $180. Kiwanis Club of Strasburg for their ongoing help, and a donation of $32. Amy for 9 lovely hand crocheted afghans. Diane Cary for a stack of new books. Ola Mae and Oliver for their gifts of handmade blankets and toys. CWF, Saumsville Christian Church (Disciples of Christ) for their donation of $100. Bonnie, Montpelier (VA) for a wonderful box of new clothes. Strasburg Rotary Club for their donation of $100. Walmart, Harrisonburg for a $25 Gift Card. JC, Edinburg for a gift of $20. Andrea, Audubon NJ for a bag of welcome baby clothes. Loretta, Woodstock for two lovely outfits. Linda, Greenville NC for a bag of lovely baby items. Chloe, Lynn and Robyn for a bundle of help. JWR, Edinburg for a gift of $20. Shenandoah County Thrift Store for a donation of $1,000. Sally Voth and The Northern Virginia Daily for front-page coverage of A Small Hand (July 20, 2010). WSVG 790 AM and Craig Orndorff for giving us air-time to talk about A Small Hand, our needs and progress. Woodstock UMC for showering us with clothing and baby essentials. Women of the Moose, Strasburg Chapter No 1319 for their donation of $100. The ladies of St. John's UMC, Edinburg, for their generous donation of clothing and baby items. Anonymous donor, St. John's UMC, Edinburg. ($20). Beta Sigma Phi Sorority, Woodstock, for their donation of $100. Woodstock Clothes Closet for their donation of $500. Edinburg Christian Church Women's Fellowship for their donation of $400. Zion Christian Church Women's Fellowship for their donation of $50. Zion Christian Church (Maurertown) 'Happy Hustlers' for their donation of $50. UHaul for a $200 certificate to offset the cost of renting a 14' truck to collect donated tables, desk, filing cabinets and chairs organized by Gifts in Kind. Thank you to both organizations and to the volunteers at both ends who loaded and unloaded some very heavy tables! The Free Press and Mona Casteel for featuring our opening (May 6th). United Bank for their donation of $1,000; and to Ingrid Thompson for her professional and caring help. 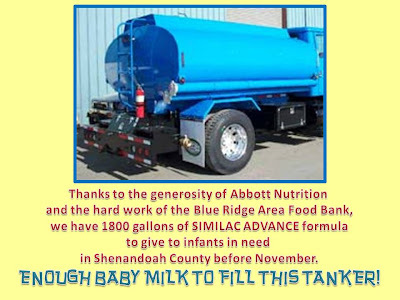 Abbott Nutrition for one hundred $5 Coupons to purchase SIMILAC formula; and to Lisa Dubbelde for her willingness to explore help for our pantry. DELL for their donation of a photocopier; and to the VFW Department of Virginia, Staunton, for serving as a distributor. Mercury Paper Inc., Strasburg for their donation of 900 rolls of toilet paper; and to Bob Nelson for his ready help. Target, Front Royal, for a $35 Gift Voucher for baby food. The VFW Post 2447, Edinburg for their donation of $200. 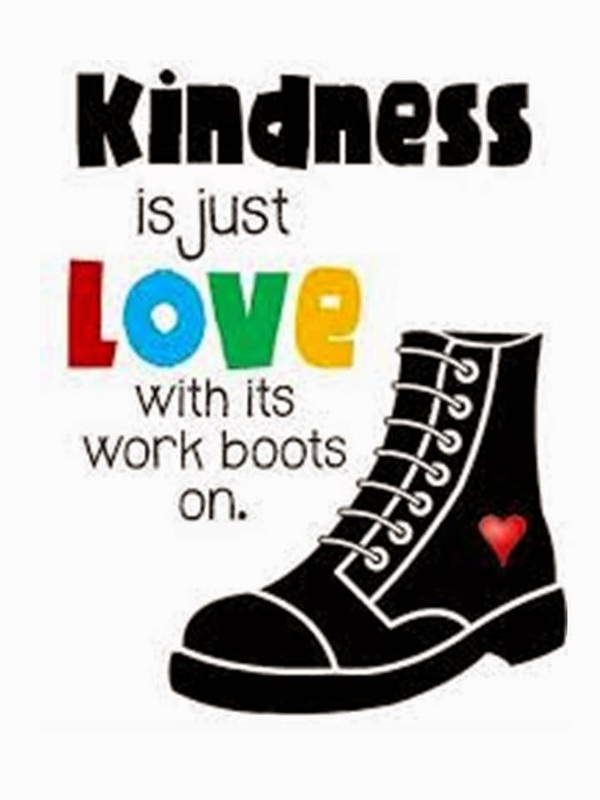 To compassionately and helpfully meet basic needs for food, medical care, clothing, shelter and other necessities of life. To enable families and comunities to be self-reliant in food production, water, sanitation and other basic necessities. The District 11 Mens Fellowship, Christian Church (Disciples of Christ) for their donation of $300. INFANT CRISIS SERVICES of Oklahoma City (http://www.infantcrisis.org/) who have generously shared with us their model, their knowledge and their experience, their enthusiasm and their encouragement. A special thank you to their Executive Director, Miki Farris, for her unfailing generosity and help.